DOME Letterbox Bespoke - Choose your colours! You can now design your own letterbox by choosing the color combination of this popular B110 letterbox. To match a specific theme on your building, or simply to be different, we have the unique letterbox for you! The Dome postbox is an original design letterbox able to hold a large amount of post and magazines. 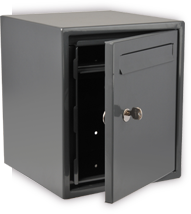 This large capacity post box is constructed from steel and then powder coated, making the dome postbox strong and durable.The Dome post box is supplied with a perspex nameplate and a security lock. As all these bespoke letterboxes are made to order, please allow 2-3 weeks for delivery.